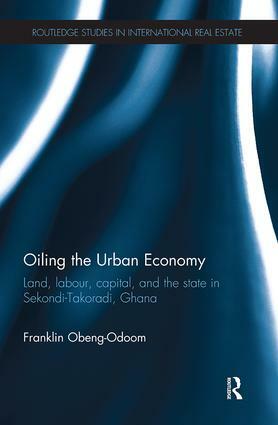 This book presents a critical analysis of the ‘resource curse’ doctrine and a review of the international evidence on oil and urban development to examine the role of oil on property development and rights in West Africa’s new oil metropolis - Sekondi-Takoradi, Ghana. It seeks answers to the following questions: In what ways did the city come into existence? What changes to property rights are oil prospecting, explorations, and production introducing in the 21st century? How do the effects vary across different social classes and spectrums? To what extent are local and national institutions able to shape, restrain, and constrain trans-national oil-related accumulation and its effects on property in land, property in housing (residential, leisure, and commercial), and property in labour? How do these processes connect with the entire urban system in Ghana? This book shows how institutions of varying degrees of power interact to govern land, housing, and labour in the city, and analyses how efficient, sustainable, and equitable the outcomes of these interactions are. It is a comprehensive account of the tensions and contradictions in the main sectors of the urban economy, society, and environment in the booming Oil City and will be of interest to urban economists, development economists, real estate economists, Africanists and urbanists.